Production methods that unite man and machine in a global network and draw upon cutting-edge information and communication technology are already a reality: The Structural Development Laboratory is now home to a new tester that not only simulates the braking noises made by a complete vehicle without requiring a car to be present, but also communicates in real time with the corresponding systems in North America. The result: shorter development times. Two components singing solos: The strut and the brake disk can each be tested as though they were already part of a complete vehicle driving down the street. It’s all in the details: Thomas Neff, Philipp Penther, Robert Thomas Bender, and Klaus Osterhage (from left) consulting one another. 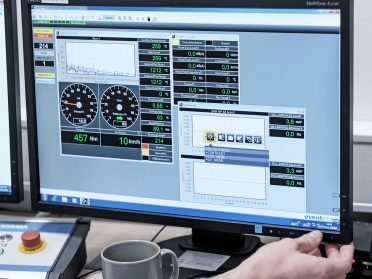 “Now, for the first time ever, we can generate braking noises on the corresponding components in a reproducible way and objectively analyze them without requiring a complete vehicle,” explains Project Manager Robert Thomas Bender. 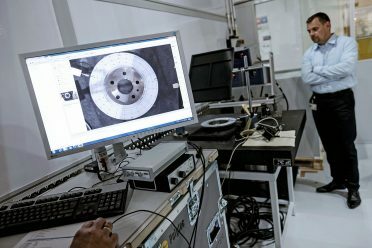 “At the same time, we can recreate all of the various climactic and temperature profiles that exist around the world in the test chamber.” More specifically, brake discs, wheel bearings, and other braking system elements are accelerated up to 2,200 revolutions per minute and braked while microphones, lasers, and sensors record the resulting acoustic vibrations. This is carried out at temperatures between -30°C and +50°C and humidity levels between five and 95 percent. No steering wheel, no asphalt: The new face of braking noise development. Mobile measurement: The data recorder provides all relevant information on the tested components. 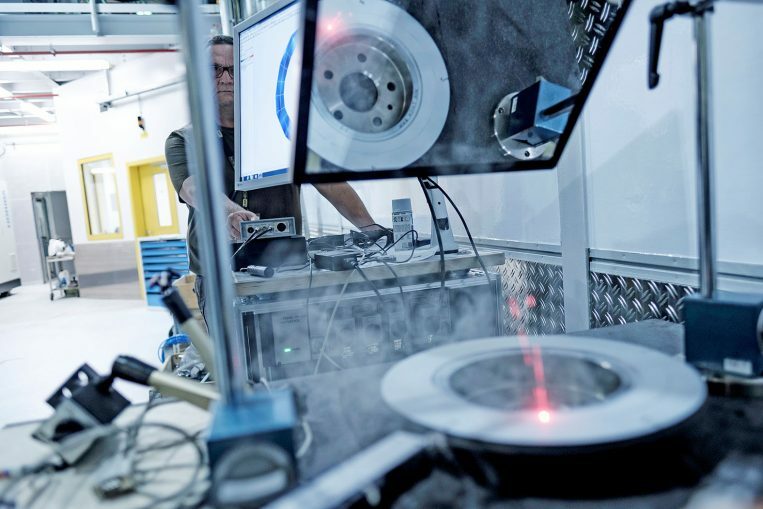 “In the past, Opel carried out braking noise development only through detailed testing with vehicle prototypes to obtain comparably reliable results,” explains Laboratory Manager Klaus Osterhage. Unfortunately, prototypes are notoriously expensive, and the market is demanding ever-shorter development times. Thankfully, the new tester helps make vehicle development faster and less expensive. 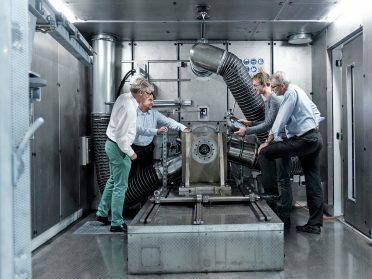 “We can also test samples that are still in development to find where and to what extent they can be further optimized,” adds Test Engineer Philipp Penther. That had also required a great deal more time and money in the past. Everything under control: Philipp Penther and Joachim Antusch oversee the series of tests from the control room. These are not the only steps toward the future that the new system represents. 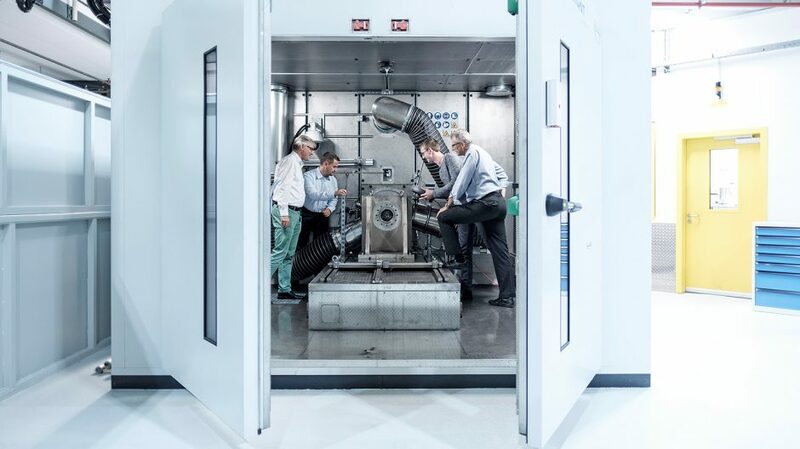 It also works exactly like the GM tester in North America that is set to act as a sort of ‘prototypical’ testing facility within the company for braking noise analyses. 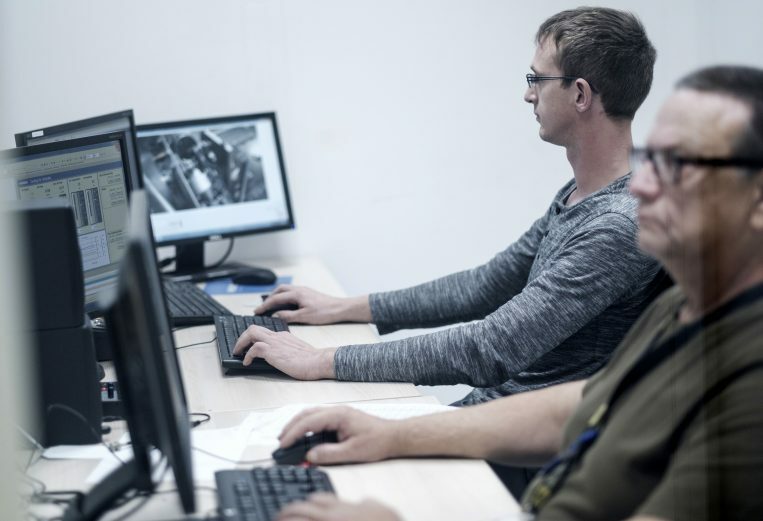 “This allows our results to be accepted worldwide – and fellow workers all over the world can refer to them, too,” explains Brake Developer Thomas Neff. A complete overview: All of the test results are displayed in the control room. The utmost precision: The 3D laser vibrometer records mechanical vibrations in the components. Usually, laser beams are not visible – extra smoke was created so that the photo could be taken. 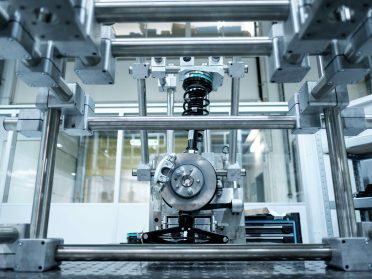 Satisfied: Brake Developer Thomas Neff takes a look at the 3D laser vibrometer. 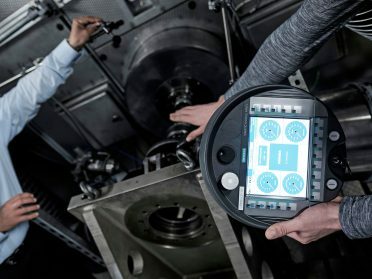 Local ties are still important, even though the tester is globally networked: “We’re happy that we were able to develop the tester together with Horiba, a company located in Darmstadt, Germany, only 25 kilometers away from Rüsselsheim.” Exchanging ideas in person remains a valuable part of Industry 4.0. That also applies to planning future projects. “We’re currently designing a next-generation tester for inspecting our brake performance,” announces Klaus Osterhage. It’ll be another high-tech innovation that speeds up development times even further.